Happy Wednesday, and welcome to the next chapter of everyone’s favorite student from the stars – Albert the Alien! Today we see Albert’s school supplies are not normal inanimate objects, like our school supplies. In fact, they appear to be somewhat EVIL! When coming up with the concepts for Albert the Alien, I knew I wanted to turn a normal first day in school on its side. So I asked myself what were things everyone brought to school with them on the first day of school – and how do we make that cool and interesting for Albert? School supplies seemed like a natural thing to manipulate – what if they had personas, and did the teaching at Albert’s school? What if they finally got off world and decided they could do a better job teaching than our teachers? 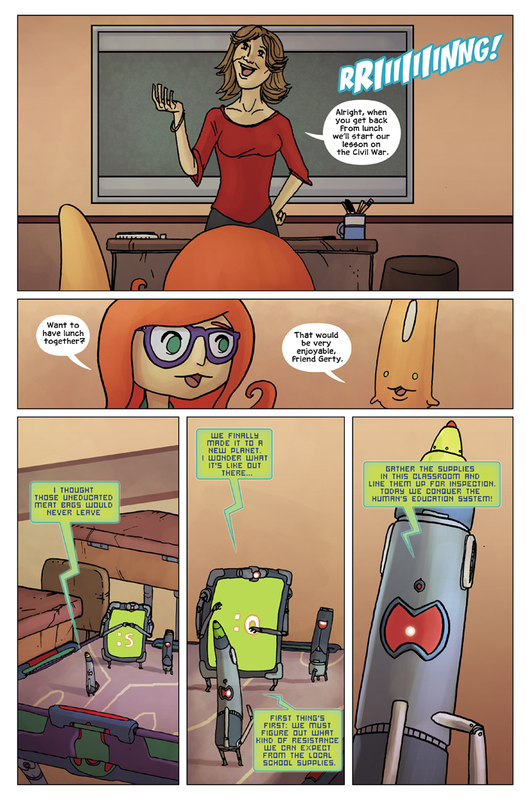 Having the school supplies be characters was a fun way to introduce the world of Albert to the readers, and for me to platform later adventures to come. Plus, they’re a lot of fun to write. The drill Sargent-like laser pen, the correcting / explanatory tablet, and the silent laser pointer – which fires real lasers! We’ll be seeing a lot of these guys throughout our first adventure with Albert. Come back on Friday for more fun adventures!